I did not make this Snack Stadium. I didn’t take the picture either, but gosh darn it, I sure do wish I had! It doesn’t even need to be said, but the Super Bowl is tomorrow. Ever since the Giants beat the 49ers, I started to see two food items pop up with greater and greater frequency. The first is obvious: wings. Yes, entire miniature football stadiums made out of Super Bowl party food! Did you know that Americans will eat one billion dollars’ worth of snack food tomorrow? I wonder how much of that will go into making snack stadiums . . .
For more images of snack stadiums, click here. And Serious Eats does a nice how-to slideshow here if you are ambitious enough to try to construct your own. I personally do not recommend that you do it. That snack stadium reminds me of the Spam carving contests. Remember those? I know! It is scary, gross, and amazing all at the same time. I think that the “football field” is actually made out of sea of guacamole — which kind of ups the gross factor, no? Very impressive creation! I’d like to have this snack stadium too! I think a man must have made this . . . Seriously though, this would be an awesome sports food challenge. Man or woman. I was actually a little surprised the Giants won. I mean, what are the chances of beating the Pats in the Super Bowl again? But they totally did. Did you go to a party? 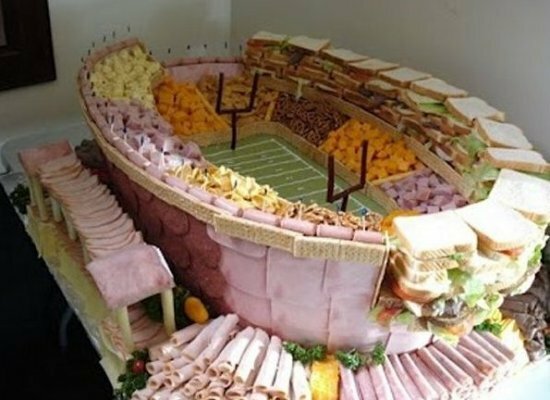 I would be a little scared to tuck into a Super Bowl snack stadium too. What if I took a sandwich and the whole thing came crashing down into the field of guac? It’s like a more disgusting version of fancy gingerbread houses . . . However, I really, really, really want to make one next year though!